Vladimir Putin is a black belt and a Master of Sports in Judo. Political analyst Amine Kamourieh, writing today for the independent Beirut daily an-Nahar, says the Russian president is also an excellent hunter and marksman. And he just proved to be an accomplished acrobat who can execute a full back somersault at the last minute to avoid falling into an abyss. Putin can be a Machiavellian diplomat at a whim and is always prepared to hide his deadly iron fist in a velvet glove. His attributes, love of the spotlight and innumerable qualities while in office made him a media superstar on the world stage. In the Syria crisis, Russia's new tsar showed a penchant for global leadership. Yesterday, he proved to be a Chess Grandmaster. 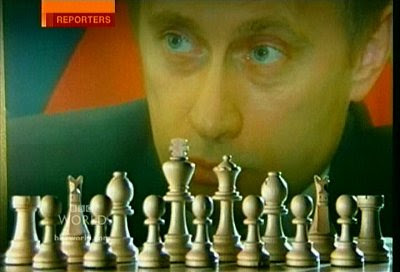 With one spectacular move, his "Rook" checkmated America's "Black King" that has been threatening Syria. Hours earlier, a potential military strike from U.S. forces was hanging over Syria. Talk was not so much about the strike's timing as about its sequels. The Russian Grandmaster changed all this with an airtight proposal. If the strike on Syria is to deter Syrian President Bashar al-Assad from using his chemical arsenal, better put Syria's chemical weapons stockpiles under international control and spare Syria and the rest of the world the evils of war and its likely catastrophic aftermath. The proposal puts U.S. plans for a strike against Syria on hold. Putin's smart suggestion helps U.S. President Barack Obama and Assad climb down the high tree. By so doing, the Russian president avoided a head on clash between Moscow and Washington over Syria and let his Syrian ally off the hook while denying Damascus the opportunity of claiming "victory." By yielding control of its chemical weapons, which it invariably described as a "strategic" asset in a face-off with nuclear Israel, the Syrian regime would be effectively turning tail on what it usually described as a "sovereign" issue. The Syrian regime would at the same time be implicitly owning up to (chemical weapons) violations. Putin's plan also helps Obama save face after talking himself into a corner on intervention in Syria and finding it hard to muster the support of Congress, the American public and U.S. allies for action against Assad forces. The plan for international control of Syrian chemical weapons steals Obama's thunder. If adopted and implemented, it would crown Putin's move as one of the greatest since the days of the Russian Grandmasters.